Superiority of an individual or a species over another is a harsh lesson to learn, but nature is harsh – it keeps handing this lesson out whether you want it or not. Humans have been at the top of the food chain for a very long time. But what if we weren’t? I was reminded of this just the other day. My husband believed for the longest time he didn’t like cats. He thought them to be cold, unemotional creatures. He liked dogs, because they always greet you with a wagging tail and a happy disposition and are always eager to please. So for many years of our marriage he resisted the pressure from me and the kids to acquire a cat. But eventually he caved and in his usual fashion, didn’t just acquiesce. He had to do it in style: He went and picked out a kitten he liked, bought all the essential supplies, then brought it home inside his jacket one evening and surprised the hell out of us. That’s how we acquired our silver stripe, Pippin. We quickly realized Pippin needed company and added a calico, Merry. 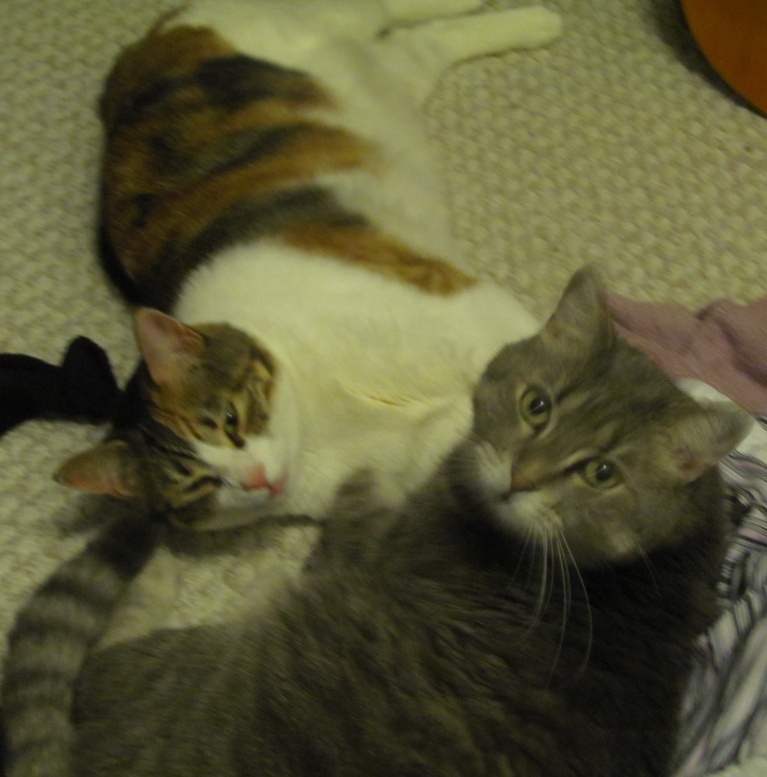 For several years we remained a stable, two-cat household. Merry, by the way, became Mark’s cat. She idolizes him, curls up with him when he snoozes and talks to him when her water bowl is empty. She is his girl. No, I am not jealous. 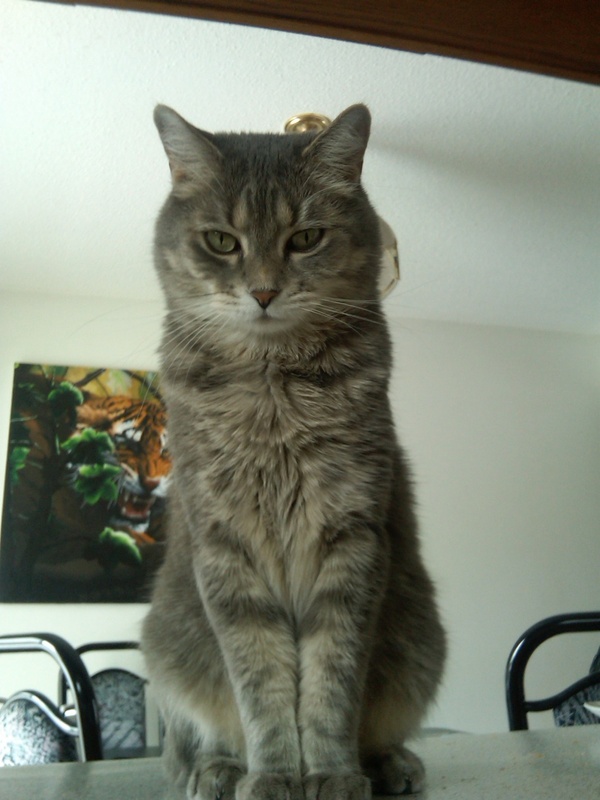 She head-bumps me, too. Then two Christmases ago, our middle son, Matthew, heard about a litter of nine kittens that had been abandoned in a barn. The snow was very deep and it was incredibly cold that Christmas. We hesitated for maybe fifteen minutes while we wondered if Pippin, the male, would get his nose out of joint. Then we figured we’d worry about it later. 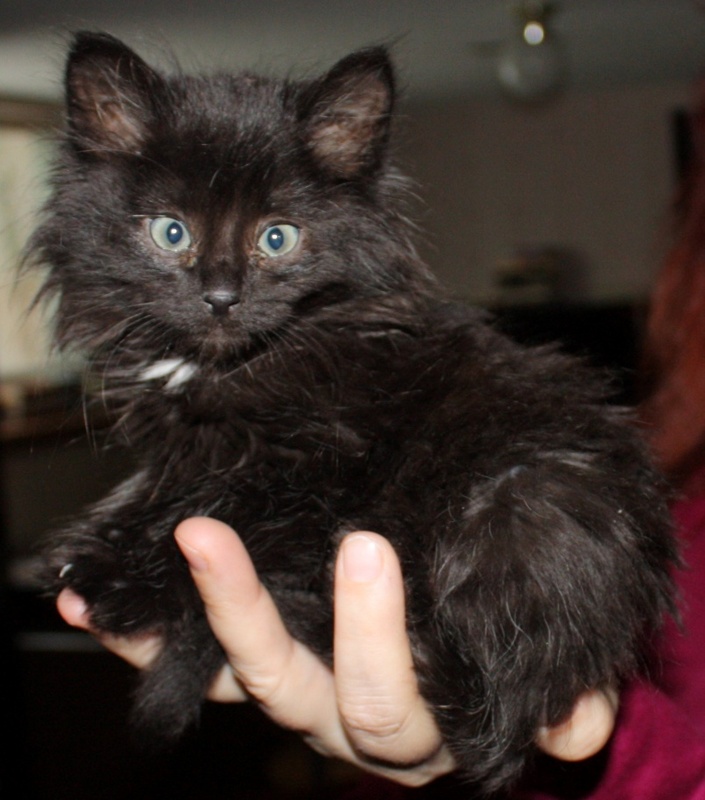 The kitten that came home with Matthew was small enough to sit on the palm of my hand. It was a mass of fuzzy black fur that looked like it had never had the benefit of a mother’s grooming. In amongst that fur were two electric blue eyes darting in every direction as this tiny kitten tried to take in everything at once. And just at the base of its delicate neck was a startling, small patch of white, like a medallion. As we already had two characters from Lord of the Rings, this ragged ranger from the wilds simply had to be Strider – black overcoat, blue eyes, medallion and all. It took us about three weeks to realize that Strider had the cat equivalent of ADHD. And no, he hasn’t grown out of it. Two years later, he out-weighs both Pippin and Merry, and he’s still bouncing off walls, leaping into the air for no particular reason, and chasing shadows. And when shadows won’t do, he’ll chase his tail – the first and only cat I’ve ever seen that does the dog thing. He also pants like a dog. I’ve researched it and discovered that cats pant when they’re excited. Strider gets excited a lot. A three cat household creates some interesting dynamics. Merry is female, so we didn’t have to worry too much about her. It was Pippin and Strider we had to keep an eye on. Pippin had been top Tom all along. We needed to make sure he accepted Strider and as Strider grew, that Strider didn’t nudge Pippin out of the group, either. Having them both neutered helped considerably and keeping a careful eye on feeding time and unsnarling arguments over the feeding bowls, etc., has kept most of the hierarchy disputes to a minimum. Pippin has continued to remain top cat in charge except when it came to eating. He always hung back until the other two had finished. Until last weekend. Strider, as I mentioned, is two years old now, and he’s a fully grown, heavy little beast. Especially when you pick him up, because he flops completely in your arms, his legs and paws all hanging which way so his belly is exposed for rubbing and that’s when you really notice how much he weighs! I can’t tell you what happened last weekend that made a difference. There was no big fight or showdown, because we weren’t woken up by cats screaming and clawing each other to pieces. But something happened overnight. Because now, all three cats eat from the food bowls at the same time. Pippin doesn’t hang back anymore. And now all three cats sit together, lie together, and walk around together. Détente has been reached. In Blood Stone, vampires are the top cats in the hierarchy – at least for a while. They’re the superior species even to humans, even though most humans aren’t aware of that fact. But somewhere in the middle of the story, the vampires discover they’re not the most powerful species after all (and I won’t spoil the story for you by saying why). The more interesting part of that discovery is that some of them don’t take it so well. That’s a natural, knee jerk reaction. I don’t think a lot of humans would take it well if they discovered they were no longer the most powerful creatures on the planet anymore, either. It’s the survival instinct kicking in. If you discovered that vampires really did exist, for instance, and given that vampires are so powerful and virtually omnipotent, how would you feel, knowing that your survival as a species was now threatened? Would you fight? Or would you, like Merry, Pippin and Strider, try to come to some arrangement? This is the question that the humans and the vampires in the Blood Stone series face and have to answer, and it’s not an easy answer to give. Survival, when you’re not the superior species, never is an easy question.